Bee's Wax, the superior natural wax! * Long burning without additives! These candles are not blended with other waxes. 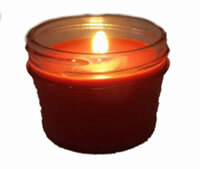 100% pure bee’s wax candles can burn as long 100 hours per pound of wax! * Cleaner burning - No toxins, carcinogens or pollutants which means it's less likely to trigger allergies. No petrol-carbon soot like you get from petroleum-based paraffin candles. Perfect for indoor use! * All natural! This wax wasn’t produced in a factory. Our wax is made by Bees harvested by Bee Keepers. * Nature already scented them. Bee’s wax has a light natural aroma. We see no need to alter it. * Wood wicks compliment the natural qualities of bee’s wax and provide a unique look. -Only the best local organic Bees Wax for our Candles, we strive to provide our clientele with only top quality waxes. Because of this we search for local beekeepers that harvest wax under the strictness of conditions. * Wildflower honey and wax production must be without pesticides, hormones, or any other unnatural chemical agent. * Triple filtered to ensure purity. * Most importantly they must be kind to their bees. They are living things that deserve our gratitude and respect. Currently Lara Bee LLC of Lake Orion Michigan provides us with a limited supply of wax that meets these criteria. Their waxes and honey are free of pesticides, hormones or any other chemical. We highly recommend his honey as well, it’s delicious. Once the candles are gone, they are gone for the season! Don’t worry though, the bees will be hard at work making more. We are still searching for other sources of wax. When we find other sources our candle stock will reflect that. We won't blend waxes. A Lara Bee candle will only contain Lare Bee wax.